Selecting Print from the File menu or from the toolbar prints your document. 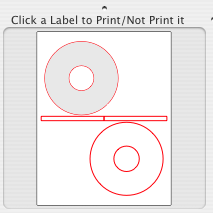 To specify the labels to be printed, make the selection from the page preview on the left bottom of the CD/DVD Home Disc Labels for Mac window. Clicking on a label makes it gray, which means that it's excluded from teh printing. 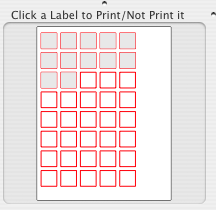 One more clicking on the same label makes it printablle again. 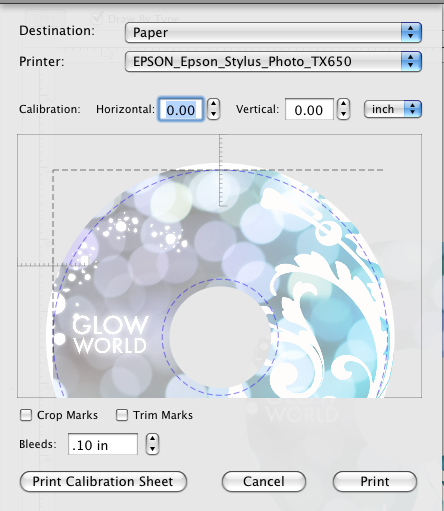 Selecting Epson Direct to Disc from the Destination popup menu allows Direct to Disc printing on Epson printers. Bleed is a printing term that refers to printing that goes beyond the edge of the sheet after trimming. The bleed is the part on the side of your document that gives the printer that small amount of space to move around paper and design inconsistencies. Bleeds in the USA generally are 1/8 of an inch from where the cut is to be made. Bleeds in the UK and Europe generally are 2 to 5mm from where the cut is to be made. This can vary from print company to print company. Some printers ask for specific sizes; most of these companies place the specific demands on their website. Crop marks placed at the corners of a form to indicate where the label edges are. The Trim Marks are based on an imaginary region drawn around the area of your label.